If it’s too cold for you, it’s too cold for them. That’s the rule of thumb that animal-care experts suggest pet owners follow in deciding whether to bring their furry friends indoors as much of the nation experiences an Arctic blast that’s lowering temperatures well below the freezing point, with about 90 million people encountering sub-zero readings. Those are not safe conditions for man or beast, no matter how much a dog may love to play outside. As Iowa City braces for temperatures of minus-20 and even lower Wednesday and Thursday, animal services coordinator Chris Whitmore is advising residents to limit their pets’ exposure to the minimum – just long enough to take care of their bodily functions. Much like humans, dogs will shiver when they’re cold, a sign they need to go inside. Whitmore and other authorities in the field offered a number of tips for the millions of American animal lovers who will be dealing with frigid weather in the coming days. • Cover them up: Dogs with thicker coats have higher tolerance to cold weather, but short-haired breeds like chihuahuas, beagles and greyhounds don’t have much natural shield from the elements. If taking them out for a walk of more than a few minutes, put a sweater or coat on them. If the dog will tolerate them, booties provide added protection for their feet. That part of their body is especially vulnerable to the rock salt often used as an ice-melting agent, irritating their paws. It can also be harmful if swallowed. Once back inside, make sure to wipe off the dog’s feet and belly with a moist rag. • Knock on the car hood or blow the horn: Cats have a knack for finding warm spots when it’s cold, but oftentimes that can be a wheel well or a nook underneath the hood of a car that was recently turned off. The noise from a knock or the horn will scare them away. “Every winter we get cases where a cat has been killed or severely injured because they were napping near the engine and the engine was turned on,’’ said Rob Halpin, director of public relations for a Boston branch of the Massachusetts SPCA. • Beware of antifreeze: Animals are drawn to the smell and sweet taste of ethylene glycol in regular antifreeze, which crystallizes in their lungs and kills them. Colder temperatures often remind drivers to add antifreeze to their vehicles, and spillages become hazardous to animals. There is a pet-safe version of antifreeze that instead uses propylene glycol – some states require its use – but it’s more expensive and some drivers eschew it. • Go outside with them: As uncomfortable as it might be, it’s best to accompany dogs outside to do their business instead of letting them roam by themselves in the yard. Though most dogs will want to scurry back to where it’s warm, some may not be able to resist chasing a squirrel or running around. “They’re like children. They don’t know when they’re starting to get frostbite, hypothermia, so you have to be the responsible one,’’ Whitmore said. 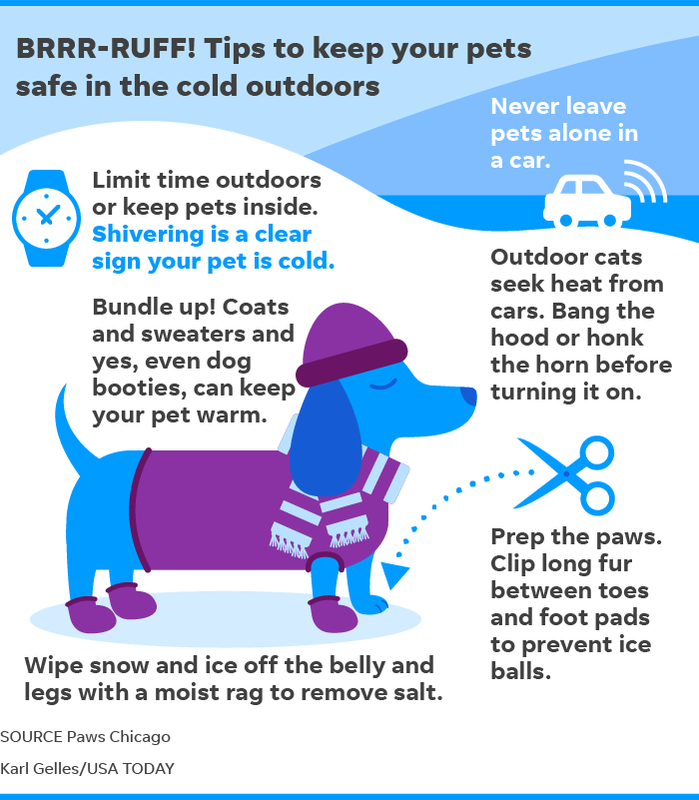 • Don’t leave pets in the car: The Chicago branch of PAWS says cold weather can create “a freezer-like environment’’ inside a car that’s turned off, so it discourages owners from traveling with their pets during the winter. If pets must come along, they shouldn’t be let alone in the vehicle even for short spells. • Shelter, food and water: Stray cats can withstand temperatures around 15-20 degrees but are in danger of hypothermia when the mercury drops lower. Some cities give away small, insulated boxes that serve as shelter for cats – they can also be made easily out of Styrofoam coolers – and volunteers or other residents spread them around. “That can mean the difference between life and death for an outdoor cat or cats,’’ Halpin said. For people who like to look after neighborhood cats that may visit from time to time, experts suggest leaving food and warm water available to them. It’s important the water remain liquid because hydration is critical to maintaining proper body temperature. • Check online: Go to the websites of animal-protection organizations like the Humane Society and the ASPCA for more information on how to keep pets safe during extremely cold weather.